the phony question whether or not the government securities market is “free.” A central bank cannot perform its functions without powerfully affecting the prices of government securities. I don’t believe this is a question that economists asked much in the decades before the Great Recession. In most macro models I’m familiar with, there is simply “the interest rate,” with the implicit assumption that the whole rate structure moves together so it doesn’t matter which specific rate the monetary authority targets. For Hansen, by contrast, the structure of interest rates — the term and “risk” premiums — is just as natural an object for policy as the overall level of rates. And since there is no assumption that the whole structure moves together, it makes a difference which particular rate(s) the central bank targets. What’s even more striking is that Hansen not only believes that it matters which rate the central bank targets, he is taking part in a conversation where this belief is shared on all sides. Not even the most conservative pole of the 1950s debate goes as far as today’s New Keynesian orthodoxy that monetary policy can be safely reduced to the setting of a single overnight interest rate. If the central bank limits itself to the short market, and if the lags are serious, the mere creation of large reserves may not lower the long-term rate. Keynes had this in mind when he wrote: “Perhaps a complex offer by the central bank to buy and sell at stated prices gilt-edged bonds of all maturities, in place of the single bank rate for short-term bills, is the most important practical improvement that can be made in the technique of monetary management. . . . The monetary authority often tends in practice to concentrate upon short-term debts and to leave the price of long-term debts to be influenced by belated and imperfect re- actions from the price of short-term debts.” ‘ Keynes, it should be added, wanted the central bank to deal not only in debts of all maturities, but also “to deal in debts of varying degrees of risk,” i.e., high grade private securities and perhaps state and local issues. That’s a quote from The General Theory, with Hansen’s gloss. Monetary policy can operate on two planes: (1) controlling the credit base – the volume of reserve balances- and (2) changing the interest rate structure. The Federal Reserve has now backed away from the second. The Treasury emphasized in these hearings that this is its special bailiwick. It supports, so it asserts, the System’s lead, by issuing short- terms or long-terms, as the case may be, according to whether the Federal Reserve is trying to expand or contract credit … it appears that we now have (whether by accident or design) a division of monetary management between the two agencies- a sort of informal cartel arrangement. The Federal Reserve limits itself to control of the volume of credit by operating exclusively in the short end of the market. The Treasury shifts from short-term to long-term issues when monetary restraint is called for, and back to short-term issues when expansion is desired. This was interesting to me because I’ve just been thinking about the neutrality of money, and what an incoherent and contradictory idea it is. The orthodox view is that the level of “real” economic activity is determined by “real” factors — endowments, tastes, technology — and people simply hold money balances proportionate to this level of activity. In this view, a change in the money supply can’t make anyone better or worse off, at least in the long run, or change anything about the economy except the price level. Just looking at these ads shows us why that can’t be true. First of all, the question of what constitutes money. All three of these ads are, in effect, inviting you to use something as money that you couldn’t previously. Without the specialized intermediary services being hawked here, you couldn’t pay the startup costs of a business with a necklace (what’s this thing made of, plutonium? ), or pay for a subway ride with a promise to pay later, or pay for much of anything with a used couch. And this new liquidity has real benefits — otherwise, no one would be buying it, and it wouldn’t be worth the cost of producing (or advertising) it. The idea — stated explicitly in the Borro ad — is that the liquidity they provide allows transactions to take place that otherwise wouldn’t. The ability to turn a piece of jewelry or a car into cash allows people to use productive capacities that otherwise would go to waste. And of course this makes sense. The orthodox view is that money is useful — there must be a reason that we don’t live in a barter world, and more than that, that all this huge industry of liquidity provision exists. But money, for some reason, is not subject to the same kind of smoothly diminishing returns that other useful things are. There is a fixed amount you need, you can’t get by with less, and there’s no benefit at all in having more. The problem is worse than that, since the standard view is that money demand is strictly proportionate to the volume of transactions. But, which transactions? Presumably, the amount of economic activity depends on the availability of money — that’s what it means to say that money is useful. And furthermore, as these ads implicitly make clear, some transactions are more liquidity-intensive than others. No one is offering specialized intermediary services to help you buy a hamburger. So both the level and composition of economic activity must depend on money holdings. But in that case, you can’t say that money holdings depend only on the volume of activity — that would be circular. In a world where money is used at all, it can’t be neutral. An increase in the money supply (or better, in liquidity) may raise prices, but it won’t do so proportionately, since it also enables people to benefit from increasing their money holdings (or: shifting toward more liquid balance sheet positions) and to carry out liquidity-intensive transactions that were formerly unable to. This has made me entertain a doubt concerning the benefit of banks and paper-credit, which are so generally esteemed advantageous to every nation. That provisions and labour should become dear by the encrease of trade and money, is, in many respects, an inconvenience; but an inconvenience that is unavoidable, and the effect of that public wealth and prosperity which are the end of all our wishes. … But there appears no reason for encreasing that inconvenience by a counterfeit money, which foreigners will not accept of in any payment, and which any great disorder in the state will reduce to nothing. There are, it is true, many people in every rich state, who having large sums of money, would prefer paper with good security; as being of more easy transport and more safe custody. … And therefore it is better, it may be thought, that a public company should enjoy the benefit of that paper-credit, which always will have place in every opulent kingdom. But to endeavour artificially to encrease such a credit, can never be the interest of any trading nation; but must lay them under disadvantages, by encreasing money beyond its natural proportion to labour and commodities, and thereby heightening their price to the merchant and manufacturer. And in this view, it must be allowed, that no bank could be more advantageous, than such a one as locked up all the money it received, and never augmented the circulating coin, as is usual, by returning part of its treasure into commerce. It is indeed evident, that money is nothing but the representation of labour and commodities, and serves only as a method of rating or estimating them. Where coin is in greater plenty; as a greater quantity of it is required to represent the same quantity of goods; it can have no effect, either good or bad, taking a nation within itself; any more than it would make an alteration on a merchant’s books, if, instead of the Arabian method of notation, which requires few characters, he should make use of the Roman, which requires a great many. 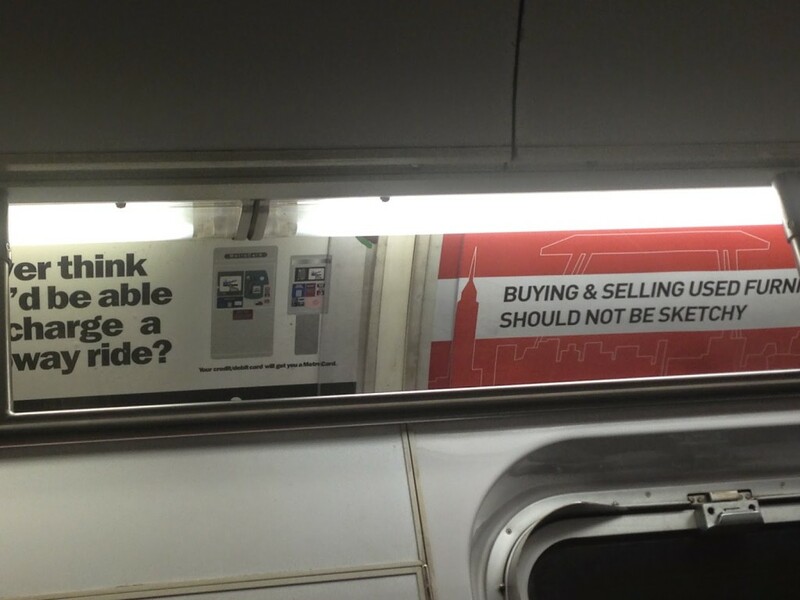 From this view — which is, again, just taking the neutrality of money to its logical conclusion — services like the ones being advertised on the F train are the exact opposite of what we want. By making more goods usable as money, they are only contributing to inflation. Rather than making it easier for people to use necklaces, furniture, etc. as means of payment, we should rather be discouraging people form using even currency as means of payment, by reducing banks to safe-deposit boxes. It must, however, be confessed, that, as all these questions of trade and money are extremely complicated, there are certain lights, in which this subject may be placed, so as to represent the advantages of paper-credit and banks to be superior to their disadvantages. … The encrease of industry and of credit … may be promoted by the right use of paper-money. It is well known of what advantage it is to a merchant to be able to discount his bills upon occasion; and every thing that facilitates this species of traffic is favourable to the general commerce of a state. But private bankers are enabled to give such credit by the credit they receive from the depositing of money in their shops; and the bank of England in the same manner, from the liberty it has to issue its notes in all payments. There was an invention of this kind, which was fallen upon some years ago by the banks of Edinburgh; and which, as it is one of the most ingenious ideas that has been executed in commerce, has also been thought advantageous to Scotland. It is there called a Bank-Credit; and is of this nature. A man goes to the bank and finds surety to the amount, we shall suppose, of a 1000 pounds. This money, or any part of it, he has the liberty of drawing out whenever he pleases, and he pays only the ordinary interest for it, while it is in his hands. … The advantages, resulting from this contrivance, are manifold. As a man may find surety nearly to the amount of his substance, and his bank-credit is equivalent to ready money, a merchant does hereby in a manner coin his houses, his household furniture, the goods in his warehouse, the foreign debts due to him, his ships at sea; and can, upon occasion, employ them in all payments, as if they were the current money of the country. Hume is describing something like a secured line of credit, not so different from the services being advertised on the F line, which also offer ways to coin your houses and household furniture. The puzzle is why he thinks this is a good thing. The trade credit provided by banks, which is now “favourable to the general commerce of the state,” is precisely what he was trying to prevent when he wrote that the best bank was one that “locked up all the money it received.”Why does he now think that increasing liquidity will stimulate industry, instead of just producing a rise in prices that will “reduce every man, in time, to the same condition as before”? You can’t really hold it against Hume that he never resolved this contradiction. But what’s striking is how little the debate has advanced in the 250 years since. Indeed, in some ways it’s regressed. Hume at least drew the logical conclusion that in a world of neutral money, liquidity services like the ones advertised on the F train would not exist. I hadn’t realized this section was a later addition until reading Arie Arnon’s discussion of the essay in Monetary Theory and Policy from Hume and Smith to Wicksell. I hope to be posting more about this superb book in the near future. The natural effect of this state of things was that a crowd of projectors, ingenious and absurd, honest and knavish, employed themselves in devising new schemes for the employment of redundant capital. It was about the year 1688 that the word stock-jobber was first heard London. In the short space of four years a crowd of companies, every one of which confidently held out to subscribers the hope of immense gains, sprang into existence… There was a Tapestry Company, which would soon furnish pretty hangings for all the parlors of the middle class and for all the bedchambers of the higher. There was a Copper Company, which proposed to explore the mines of England, and held out a hope that they would prove not less valuable than those of Potosi. There was a Diving Company, which undertook to bring up precious effects from shipwrecked vessels, and which announced that it had laid in a stock of wonderful machines resembling complete suits of armor. In front of the helmet was a huge glass eye like that of Polyphemus ; and out of the crest went a pipe through which the air was to be admitted. … There was a society which undertook the office of giving gentlemen a liberal education on low terms, and which assumed the sounding name of the Royal Academies Company. In a pompous advertisement it was announced that the directors of the Royal Academies Company had engaged the best masters in every branch of knowledge, and were about to issue twenty thousand tickets at twenty shillings each. There was to be a lottery : two thousand prizes were to be drawn; and the fortunate holders of the prizes were to be taught, at the charge of the Company, Latin, Greek, Hebrew, French, Spanish, conic sections, trigonometry, heraldry, japanning, fortification, book-keeping, and the art of playing the theorbo. Many of Macaulay’s examples, which I’ve left out here, are familiar, thanks to Charles Mackay and more recent historians of financial folly. (Including everyone’s favorite, the company that raised funds “for an Undertaking which in due time shall be revealed.”) The line about Pope is also familiar, at least to reader of The General Theory: Keynes cites it as an illustration of the position of the wealth-holder in a world where the rentier had been successfully euthanized. But I, at least, had never realized that the diving suit was a product of the South Sea bubble. And I’d never heard of this spiritual ancestor of Chris Whittle and Michelle Rhee. It would be interesting to learn more about the claims that were made for this company, and what happened to it. Alas, Google is no help. Although, “Royal Academies Company” turns out to be a weirdly popular phrase among the Markov-chain text generators that populate fake spam blogs. (Seriously, guys, this is poetry.) We can only hope that today’s enterprises that promise to give gentlemen a liberal education on low terms (or at least an education in japanning and/or ski area management) will vanish as ignominiously. What determines the level of interest rates? It seems like a simple question, but I don’t think economics — orthodox or heterodox — has an adequate answer. One problem is that there are many different interest rates. So we have two questions: What determines the overall level of interest rates, and what determines the spreads between different interest rates? The latter in turn we can divide into the question of differences in rates between otherwise similar loans of different lengths (term spreads), differences in rates between otherwise similar loans denominated in different currencies, and all the remaining differences, grouped together under the possibly misleading name risk spreads. 1. The orthodox answer, going back to the 18th century, is that the interest rate is a price that equates the desire to save with the desire to borrow. As reformulated in the later 19th century by Bohm-Bawerk, Cassel, etc., that means: The interest rate is the price of goods today relative to goods tomorrow. The interest rate is the price that balances the gains from deferring consumption with our willingness to do so. People generally prefer consumption today to consumption in the future, and because it will be possible to produce more in the future than today, so the interest rate is (normally) positive. This is a theory of all transactions that exchange spending in one period for spending (or income) in another, not specifically a theory of the interest rate on loans. The Wicksell variant of this, which is today’s central-bank orthodoxy, is that there is a well-defined natural interest rate in this sense but that for some reason markets get this one price wrong. 2. An equally old idea is that the interest rate is the price of money. In Hume’s writings on money and interest, for instance, he vacillates between this and the previous story. It’s not a popular view in the economics profession but it’s well-represented in the business world and among populists and monetary reformers,. In this view, money is just another input to the production process, and the interest rate is its price. A creditor, in this view, isn’t someone deferring consumption to the future, but someone who — like a landlord — receives an income thanks to control of a necessary component of the production process. A business, let’s say, that needs to maintain a certain amount of working capital in the form of money or similarly liquid assets, may need to finance it with a loan on which it pays interest. Interest payments are in effect the rental price of money, set by supply and demand like anything else. As I say, this has never been a respectable view in economic theory, but you can find it in more empirical work, like this paper by Gabriel Chodorow-Reich, where credit is described in exactly these terms as an input to current production. 3. Keynes’ liquidity-preference story in The General Theory. Here again the interest rate is the price of money. But now instead of asking how much the marginal business borrower will pay for the use of money, we ask how much the marginal wealth owner needs to be compensated to give up the liquidity of money for a less-liquid bond. The other side of the market is given by a fixed stock of bonds; evidently we are dealing with a short enough period that the flow of new borrowing can be ignored, and the bond stock treated as exogenously fixed. With no new borrowing, the link from the interest rate is liked to the real economy because it is used to discount the expected flow of profits from new investment — not by business owners themselves, but by the stock market. It’s an oddly convoluted story. 4. A more general liquidity-preference story. Jorg Bibow, in a couple of his essential articles on the Keynesian theory of liquidity preference, suggests that many of the odd features of the theory are due to Keynes’ decision to drop the sophisticated analysis of the financial system from The Treatise on Money and replace it with an assumption of an exogenously fixed money stock. (It’s striking that banks play no role in in the General Theory.) But I’m not sure how much simpler this “simplification” actually makes the story, or whether it is even logically coherent; and in any case it’s clearly inapplicable to our modern world of bank-created credit money. In principle, it should be possible to tell a more general version of the liquidity preference story, where, instead of wealth holders balancing the income from holding a bond against the liquidity from holding “money,” you have banks balancing net income against incremental illiquidity from simultaneously extending a loan and creating a deposit. I’m afraid to say I haven’t read the Treatise, so I don’t know how much you can find that story there. In any case it doesn’t seem to have been developed systematically in later theories of endogenous money, which typically assume that the supply of credit is infinitely elastic except insofar as it’s limited by regulation. A variation of this (call it 5a) is where reserve requirements bind and the central bank sets the total quantity of bank credit or money. (In a world of bind reserve requirements, these will be equivalent.) In this case, the long rate is set by the demand for credit, given the policy-determined quantity. The interbank rate is then presumably bid up to the minimum spread banks are willing to lend at. In this setting causality runs from long rates to short rates, and short rates don’t really matter. 6. The interest rate is set by convention. This is Keynes’ other theory of the interest rate, also introduced in the General Theory but more fully developed in his 1937 article “Alternative Theories of the Rate of Interest.” The idea here is that changes in interest rates imply inverse changes in the price of outstanding bonds. So from the lenders’ point of view, the expected return on a loan includes not only the yield (as adjusted for default risk), but also the capital gain or loss that will result if interest rates change while the loan is still on their books. The longer the term of the loan, the larger these capital gains or losses will be. I’ve discussed this on the blog before and may come back to it in the future, but the essential point is that if people are very confident about the future value of long rates (or at least that they will not fall below some floor) then the current rate cannot get very far from that future expected rate, no matter what short rates are doing, because as the current long rate moves away from the expected long rate expected capital gains come to dominate the current yield. Take the extreme case of a perpetuity where market participants are sure that the rate will be 5% a year from now. Suppose the short rate is initially 5% also, and falls to 0. Then the rate on the perpetuity will fall to just under 4.8% and no lower, because at that rate the nearly 5% spread over the short rate just compensates market participants for the capital loss they expect when long rates return to their normal level. (Obviously, this is not consistent with rational expectations.) These kinds of self-stabilizing conventional expectations are the reason why, as Bibow puts it, “a liquidity trap … may arise at any level of interest.” A liquidity trap is an anti-bubble, if you like. What do we think about these different stories? I’m confident that the first story is wrong. There is no useful sense in which the interest rate on debt contracts — either as set by markets or as target by the central bank — is the price of goods today in terms of goods tomorrow. The attempt to understand interest rates in terms of the allocation across time of scarce means to alternative ends is a dead end. Some other intellectual baggage that should overboard with the “natural” rate of interest are the “real”rate of interest, the idea of consumption loans, and the intertemporal budget constraint. But negative criticism of orthodoxy is too easy. The real work is to make a positive case for an alternative. I don’t see a satisfactory one here. The second and third stories depend on the existence of “money” as a distinct asset with a measurable, exogenously fixed quantity. This might be a usable assumption in some historical contexts — or it might not — but it clearly does not describe modern financial systems. Woodford is right about that. The fifth story is clearly right with respect short rates, or at least it was until recently. But it’s incomplete. As an empirical matter, it is true that interbank rates and similar short market rates closely follow the policy rate. The question is, why? The usual answer is that the central bank is the monopoly supplier of base money, and base money is used for settlement between banks. This may be so, but it doesn’t have to be. Plenty of financial systems have existed without central banks, and banks still managed to make payments to each other somehow. And where central banks exist, they don’t always have a monopoly on interbank settlement. During the 19th century, the primary tool of monetary policy at the Bank of England was the discount rate — the discount off of face value that the bank would pay for eligible securities (usually trade credit). But if the discount rate was too high — if the bank offered too little cash for securities — private banks would stop discounting securities at the central bank, and instead find some other bank that was willing to give them cash on more favorable terms. This was the problem of “making bank rate effective,” and it was a serious concern for 19th century central banks. If they tried to raise interest rates too high, they would “lose contact with the market” as banks simply went elsewhere for liquidity. Obviously, this isn’t a problem today — when the Fed last raised policy rates in the mid-2000s, short market rates rose right along with it. Or more dramatically, Brazil’s central bank held nominal interest rates around 20 percent for nearly a decade, while inflation averaged around 8 percent. In cases like these, the central bank evidently is able to keep short rates high by limiting the supply of reserves. But why in that case doesn’t the financial system develop private substitutes for reserves? Mervyn King blandly dismisses this question by saying that “it does not matter in principle whether the disequilibrium in the money market is an aggregate net shortage or a net surplus of funds—control of prices or quantities carries across irrespective of whether the central bank is the monopoly supplier or demander of its own liabilities.”  Clearly, the central bank cannot be both the monopoly supplier and the monopoly demander of reserves, at least not if it wants to have any effect on the rest of the world. The relevant question — to which King offers no answer — is why there are no private substitutes for central bank reserves. Is it simply a matter of legal restrictions on interbank settlements using any other asset? But then why has this one regulatory barrier remained impassable while banks have tunneled through so many others? Anyway, going forward the question may be moot if reserves remain abundant, as they will if the Fed does not shrink its balance sheet back to pre-crisis levels. In that case, new tools will be required to make the policy rate effective. The sixth story is the one I’m most certain of. First, because it can be stated precisely in terms of asset market equilibrium. Second, because it is consistent with what we see historically. Long term interest rates are quite stable over very long periods. Third, it’s consistent with what market participants say: It’s easy to find bond market participants saying that some rate is “too low” and won’t continue, regardless of what the Fed might think. Last, but not least from my point of view, this view is clearly articulated by Keynes and by Post Keynesians like Bibow. But while I feel sure this is part of the story, it can’t be the whole story. First, because even if a conventional level of interest rates is self-stabilizing in the long run, there are clearly forces of supply and demand in credit markets that push long rates away from this level in the short run. This is even more true if what convention sets is less a level of interest rates, than a floor. And second, because Keynes also says clearly that conventions can change, and in particular that a central bank that holds short rates outside the range bond markets consider reasonable for long enough, will be able to change the definition of reasonable. So that brings us back to the question of how it is that central banks are able to set short rates. I think the fundamental answer lies behind door number 4. I think there should be a way of describing interest rates as the price of liquidity, where liquidity refers to the capacity to honor one’s promises, and not just to some particular asset. In this sense, the scarce resource that interest is pricing is trust. And monetary policy then is at root indistinguishable from the lender of last resort function — both are aspects of the central bank’s role of standing in as guarantor for commitments within the financial system. You can find elements of this view in the Keynesian literature, and in earlier writers going back to Thornton 200-plus years ago. But I haven’t seen it stated systematically in way that I find satisfactory. Many persons believe that the Bank of England has some peculiar power of fixing the value of money. They see that the Bank of England varies its minimum rate of discount from time to time, and that, more or less, all other banks follow its lead, and charge much as it charges; and they are puzzled why this should be. ‘Money,’ as economists teach, ‘is a commodity, and only a commodity;’ why then, it is asked, is its value fixed in so odd a way, and not the way in which the value of all other commodities is fixed? There is, therefore, no ground for believing, as is so common, that the value of money is settled by different causes than those which affect the value of other commodities, or that the Bank of England has any despotism in that matter. It has the power of a large holder of money, and no more. Even formerly, when its monetary powers were greater and its rivals weaker, it had no absolute control. It was simply a large corporate dealer, making bids and much influencing—though in no sense compelling—other dealers thereby. But though the value of money is not settled in an exceptional way, there is nevertheless a peculiarity about it, as there is about many articles. It is a commodity subject to great fluctuations of value, and those fluctuations are easily produced by a slight excess or a slight deficiency of quantity. Up to a certain point money is a necessity. If a merchant has acceptances to meet to-morrow, money he must and will find today at some price or other. And it is this urgent need of the whole body of merchants which runs up the value of money so wildly and to such a height in a great panic…. The fluctuations in the value of money are therefore greater than those on the value of most other commodities. At times there is an excessive pressure to borrow it, and at times an excessive pressure to lend it, and so the price is forced up and down. The relevant point in this context is the explicit statement that the interest, or discount, rate is set by the supply and demand for money. But there are a couple other noteworthy things. First, the concept of supply and demand is one of monopolistic competition, in which lenders are not price takers, but actively trade off markup against market share. And second, that the demand for money (i.e. credit) is highly inelastic because money is needed not only or mainly to purchase goods and services, but first and foremost to meet contractual money commitments. See Perry Mehrling’s useful review. Most of the text of Woodford’s textbook can be downloaded for free here. The introduction is nontechnical and is fascinating reading if you’re interested in this stuff. Which is sort of a problem for Noah Smith’s neo-Fisherite view. in the same speech, King observes that “During the 19th century, the Bank of England devoted considerable attention to making bank rate ‘effective’.” His implication is that central banks have always been able to control interest rates. But this is somewhat misleading, from my point of view: the Bank devoted so much attention to making its rate “effective” precisely because of the occasions when it failed to do so. Posted on June 27, 2014 May 14, 2015 Tags finance, history of thought, interest rates, John Bull can stand many things but he cannot stand two per cent, monetary policy, the money moment24 Comments on Where Do Interest Rates Come From?